In the heart of the Steamboat Ski Mountain base area, right at the Gondola Sawtooth Mountain Residence offers ultimate ski-in/ski-out access. Entering Sawtooth Mountain Residence you will be drawn to the relaxing and elegant privacy offered by this exceptional home. 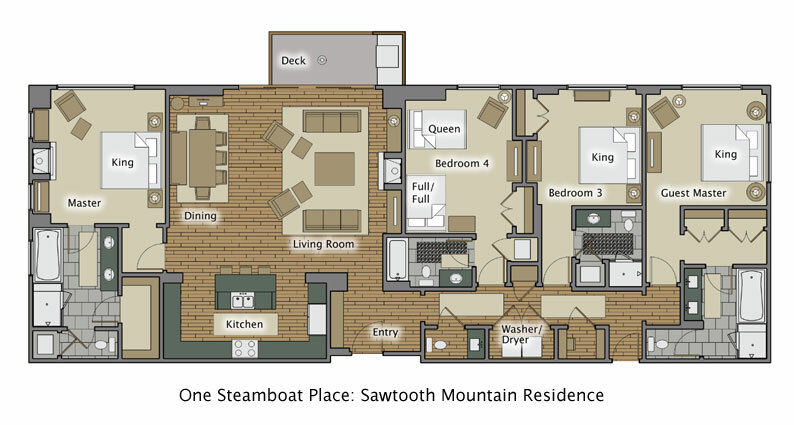 Sawtooth Mountain Residence offers all of the One Steamboat Place exacting standards and its layout takes convenience to the highest level. The Residence features four bedrooms, living and dining area connected to the kitchen with plenty of room for the entire group to gather. The professionally equipped kitchen with Viking appliances will delight the aspiring chefs in your group who can also grill in the great outdoors at the built-in Viking gas-grill on the private deck. The Master Bedroom with infloor heating, fireplace, and exceptional view; features an oversized en suite bathroom with steam shower, double sink vanity, rain shower head, and Jacuzzi tub. Two other bedrooms offer King beds with private bathrooms and the fourth bedroom offers a full / full bunk bed and a queen bed for a total guest occupancy of 10. All bedrooms have TV and DVD and the bunk room offers a Wii video games system. State of the art a/v equipment provides high definition entertainment after a full day of activity. There is also an iMac home computer and high speed Internet for all the guests to use. A printer is available at the front desk, and guests can also videoconference with the front desk from the home office.